Caye Caulker Condos is a beautiful, brand new, luxurious resort that is operated hotel style with daily room service. It is an ocean front property with eight units all facing the beautiful Caribbean sunrise. 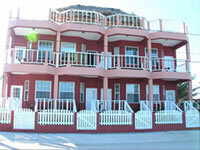 Caye Caulker Condos is located just a few minutes stroll from the center of town. Whether you want to dive, fish, snorkel, windsurf, or just relax in the sun, Caye Caulker Condos is the place to stay. Enjoy the comforts of home or visit one of the many restaurants that are only minutes away from Caye Caulker Condos. Each unit is a studio condo with a fully equipped kitchen, shower for two, and tastefully decorated interiors. All units are air conditioned and decorated in lively Caribbean style, bright and colorful with tiled floors and ceiling fans. The furniture is of mahogany, designed and crafted by local artists. The room boasts a Queen-size bed, bedside tables and a sitting area with futon. The roof top palapas allow our guests to enjoy sunsets in the refreshing evening sea breeze. If you are looking for a way to get away from it all, Caye Caulker, Belize is your choice!